Authorized Aquatech Dealer | Sales, Parts, Service | Donovan Equipment Co.
B5 Combination Truck Reduced cost with single-axle chassis mounting. 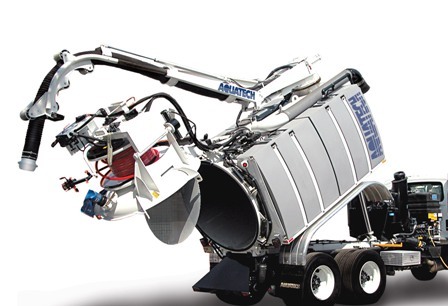 Short turning radius for narrow streets, meets the needs when a 10-yard debris body capacity is not required. B6 Combination Truck Low cost unit can be mounted on new or used chassis. 500 gallon water tank and 6-yard debris capacity to handle large jobs efficiently. B10 Combination Truck Large debris body capacity (10 cu. yd.) 1,000 gallon water capacity. Tandem axle chassis for maximum payload capacity, short wheelbase for good maneuverability. B15 Combination Truck Larger debris and water tank capacities for less trips to dump site, longer on-site cleaning time with reduced water tank fill-up suitable for long distance dump site locations. B12/2500 Combination Truck Highest volume vacuum systems, additional water for jetting suitable for very distant dump sites. CB10/15 Catch Basin Cleaning Truck Cost-effective, one-man catch basin cleaning.